The adage, "Good things come to those who wait", proved true this evening. For the past two weeks I have been prepared and excited to fly my long cross-country trip. But each time weather prevented me from making the flight. After the last let down I prepared myself for another attempt today. Yesterday it looked like there was still a chance of bad weather but as the afternoon came around the weather report was looking great. I arrived at the airport and my CFI quickly signed off on my flight plan. I think it was easy for her to do so since she had several times before reviewed my flight planning and been satisfied with my abilities to accurately plan a cross-country. That is the bright side of all the bad weather was having many opportunties to re-architect the flight. With the appropriate endorsements in the book I pre-flighted the plan and took off to the north. It was a beautiful night with light winds and great visibility. Once airborne I contacted the Dayton Flight Watch Center and opened my flight plan. The flight to Columbus went smoothly. 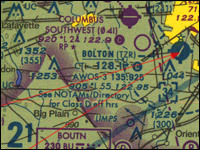 When I was within 10 miles of my first stop, Bolton Field in Columbus, I contacted the tower. They asked me to contact them on the downwind leg. The problem was I was having troubles locating the field. I had flown there during my night cross-country and it was much easier to see at night. I had to contact the tower and get vectors to the field. The tower was very friendly and soon enough I found myself on the ground enjoying a nice barbeque sandwich at JP's Barbeque Ribs. It was my first "$100 Hamburger" of my young flying career and it was wonderful. When pre-flighting the aircraft for the next leg I had a nice chat with the pilot of the plane next to me. I am continuously amazed at how friendly the brotherhood of pilots is. After departing from Bolton I flew to Green Country Lewis A. Jackson Airport just outside of Xenia, Ohio. This was a fun airport to fly into, as the airport sat atop a hill and the runway edge was about 100 feet above the road below it and there were lakes to the side. I made a quick full stop landing then departed to the south-west. I flew south of Dayton and enjoyed seeing Dayton from the sky. After Dayton there was little but farms and open land until I arrived over Oxford, Ohio home of the great Miami University. I flew over Yager Stadium home of the Miami Redskins (err Redhawks) football team who went 13-1 last seaon. After overflying Yager Stadium I made a left turn onto a 2-mile final for runway 23 at Miami University Airport. After landing, I had to taxi back on the runway as the field does not have a taxiway. I then departed on Runway 23 for my short trip back to my home field at Blue Ash. The final leg went quickly and soon enough I found myself making a picture perfect landing on runway 24 at Blue Ash. It is hard to explain the excitement and sense of accomplishment I felt as I taxied in at Blue Ash. I had just flown to four different airports, filing flight plans along the way, making four great approaches and landings all while covering over 170 miles and did it all on my own. I really felt like a pilot today and that felt great! Congratulations Todd -- may there be many more enjoyable flights for you! Yippee! Congratulations on your great flight and I cannot wait for those flights yet to come! Congrats on the cross country.